Videos, examples, solutions, and stories to help Grade 4 students learn the Divisibility Rules for 2, 3, 4, 5, 6, 7, 8, 9, 10, 11, 12, 13. 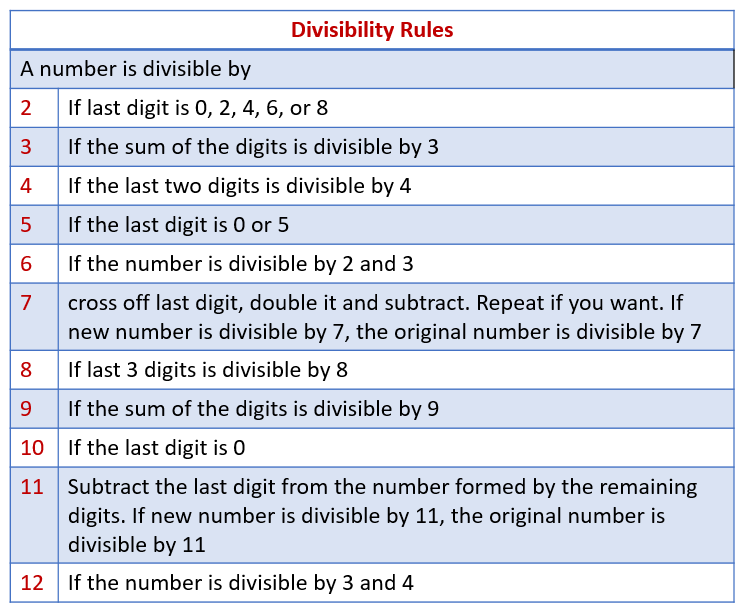 The following table gives the Divisibility Rules for 2, 3, 4, 5, 6, 7, 8, 9, 10, 11, and 12. Scroll down the page for examples and solutions. This shows you the divisibility tests for 2, 3, 5, 7, and 11, so you can tell if those numbers are factors of a given number or not without dividing. Divisibility Test for 2: The last digit is 0, 2, 4, 6, or 8. Divisibility Test for 3: The sum of the digits is divisible by 3. Divisibility Test for 5: The last digit is 0 or 5. Divisibility Test for 7: Cross off last digit, double it and subtract. Repeat if you want. If new number is divisible by 7, the original number is divisible by 7. Divisibility Test for 11: For a 3-digit number, sum of the outside digits minus the middle digit must be 0 or 11. Goes over two divisibility tests for 11 and also the one for 13. Learn the divisibility rules for 2,3,4,5,6,8,9,10, and 12. Divisibility - One number divides into another number and there is nor a remainder. A number is divisible by 10 if it ends in a zero.